For Konica/Minolta Bizhub 360 361 420 421 500 501. Location: Konica 5A. Genuine Konica/Minolta TN-511, 024E. Part Number(s) A3VV131, TN015, TN-015. Compatible With : Konica Minolta bizhub PRO 951. Manufacturer Konica Minolta. Color Black. Condition New. Part Number(s): A3VV131,TN015, TN-015. Konica Minolta Bizhub Pro 951. For Use in the Following Compatible Machine Models. Konica Minolta DR-512 Imaging Drum Unit - 120000 - 1 - OEM. Manufacturer Konica Minolta. Miscellaneous Compatibility Konica Minolta bizhub Printers:C224C284C364. Product Type Imaging Drum. Manufacturer Part Number A2XN0RD. Part Number(s): A3VU130,TN711K, TN-711K. Konica Minolta bizhub C654, Konica Minolta bizhub C654e, Konica Minolta bizhub C754, Konica Minolta bizhub C754e. For Use in the Following Compatible Machine Models. For P/#A32W011or TNP24. bizhub 20 20P 20PX printer. Genuine Konica Minolta. Location: OCE 10 N.W 2 lbs. All major credit card accepted. Laser - 8000 Page - Black Konica Minolta High Capacity Black Toner - Laser - 8000 Page - Black. Konica Minolta MC4650 Printer. For P/#8937-857,DV501K, 8937-852, 960-907, FBD6KC. Ikon CPP8050. also HP Color 9850 MFP. Genuine Konica/ Minolta BLACK Developer for. All major credit card accepted. 4162102, 1710435001. Part Number: 4162102, 1710435001. PageWorks 25 PageWorks 25 Plus. Konica Minolta. PagePro 25 PagePro 25 n. Pittsburgh, Pennsylvania 15208. 6901 Lynn Way. Pitney Bowes. Konica Minolta. Printer Models Konica Minolta Magicolor 4650DN, 4650EN, 4690MF, 4695MF. Picture is for reference ONLY! No exceptions. Make sure that it is filled in correctly. Box styles may vary from what is pictured. Mfr Part #: A3VU130. Compatibility: Konica Minolta Bizhub Printers Print Color: Black. Check-Out Now! Technical Information. Konica Minolta A0fp013 Laser Toner Bizhub 40p Bizhub 40x - Black - 19000 Page Yieldblack - 19000 Page Yield. Manufacturer Part Number A0FP013. Product Model A0FP013. Compatibility: Konica Minolta Bizhub Printers: 40P 40PX. (Part # TN-711K, TN711K, A 3VU130 ). Konica Minolta Bizhub C654. Konica Minolta bizhub C754. Konica Minolta bizhub C754e. Konica Minolta Bizhub C654e. for use in TT COPIER INC.
Konica Minolta (TN511). Excludes Alaska, Hawaii, APO, and P.O. boxes. A0FP023, TN412. Part Number: A0FP023, TN412. 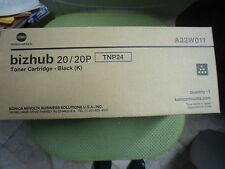 bizhub 40P Bizhub 40PX. Konica Minolta. Color: Black. Condition: Surplus - New, never used. It may have expired date codes, be missing the box, have shelf wear, tears, etc. Konica Minolta MT Toner 502A. Alternative for HP Q6471A, 502A. We are a Solvay chemical plant located in Georgia. All parts are from our Solvay Plant. We do not take international orders yet. Konica Minolta is dedicated to providing high-quality prints providing the best possible resolution, color, shading and continued reliability from your printer. Type TN015 toner estimated yield is 137,000 pages. 8938702, TN312Y. Part Number: 8938702, TN312Y. bizhub C300 bizhub C352. bizhub C352P. KONICA BIZHUB C352 WASTE TONER CONTAINER. KONICA BIZHUB C352 TONER BLACK. KONICA BIZHUB C352 TONER CYAN. KONICA BIZHUB C352 TONER MAGENTA. For Konica Minolta PagePro. and the date is only a Manufactures best guess when the product will have full SPF potency. So If Dates are of concern to you do not buy this item. You are looking at a1710567001 OEM Toner from Konica Minolta. - We only use actual pictures. Konica Minolta MT Toner 502A. Product Title Konica Minolta DR-512 Imaging Drum Unit (DR512K). Compatibility: Konica Minolta bizhub Printers: C224 C284 C364. Manufacturer Konica Minolta. Product Type Imaging Drum. We focus on making purchasing online a pleasant experience. Konica Minolta is dedicated to providing high-quality prints and continued reliability from your printer. Competitively priced and specifically engineered, genuine Konica consumables provide the best possible resolution, color and shading. New in box as pictured. Part Number: A0DK131. magicolor 4650DN magicolor 4650EN. Magicolor 4690MF magicolor 4695MF. KONICA MINOLTA MAGICOLOR 4650DN TONER CYAN 4K (TYPE AM). KONICA MINOLTA MAGICOLOR 4650DN TONER MAGENTA 4K (TYPE AM). Part Number: 1710567001. PagePro 1380mf PagePro 1390mf. KONICA MINOLTA PAGEPRO 1300 TONER BLACK HY REMAN. Konica Minolta. Color: Black. Condition: Surplus - New, never used. It may have expired date codes, be missing the box, have shelf wear, tears, etc. 8937801, 010J, 010Q, 842921H4. Part Number: 8937801, 010J, 010Q, 842921H4. Konica Minolta. KONICA MINOLTA DI-551 FUSER CLEANING WEB. MINOLTA MT STARTER 604. Color: Black. Condition: Surplus - New, never used. Genuine Konica MagiColor 5440 5450 ( 1710602-005 ) Hi-Cap. Toner Genuine. Konica Minolta AODK132 High-Yield Toner Magicolor 4600, 4650DN. Konica Minolta Laser Printers Magicolor 4650DN, Magicolor 4650EN. OEM toner for Konica Minolta Magicolor 4600, 4650DN. Konica Minolta Multifunctional & All-in-One Machines Magicolor 4690 MF, Magicolor 4695 MF. 4 out of 5 stars - Konica Minolta AODK132 High-Yield Toner Magicolor 4600, 4650DN. 1 product rating1 product ratings - Konica Minolta AODK132 High-Yield Toner Magicolor 4600, 4650DN. OEM Tnr Black 47200 Pages. A1U9132, TN616KL. Part Number: A1U9132, TN616KL. bizhub PRO C6000L. KONICA MINOLTA BIZHUB PRO C6000L TONER MAGENTA. KONICA MINOLTA BIZHUB C6000 DEVELOPING UNIT BLACK. Konica Minolta. KONICA MINOLTA 8050 WASTE CONTAINER KATUN.